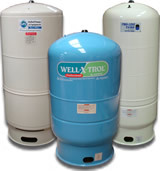 pre-charged bladder style pressure tanks, epoxy coated retention tanks, and galvanized retention tanks. The many parts used for installation of a pressure tank. Includes, pressure relief valves, tank tees, pressure gauges, air valves, drop pipe couplings, etc.